Create text boxs “4PRESENTATION ” and match the letters with the background color. 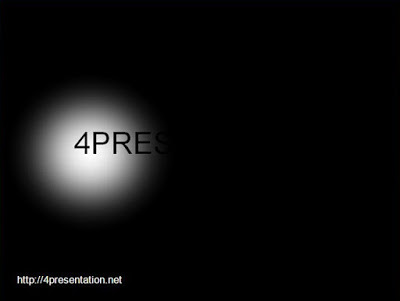 And set the order with the arrangement, the rear is the background color, then the effect of the circle, then at the front it says “4PRESENTATION” which would be the effect of masking. Ta Ra!! Animation masking has finished. NOTE : this tutorial special for powerpoint 2003. but you can also make it from powerpoint 2007 or 2010 with change step 4. make your creation..!!! Good luck..!!! !